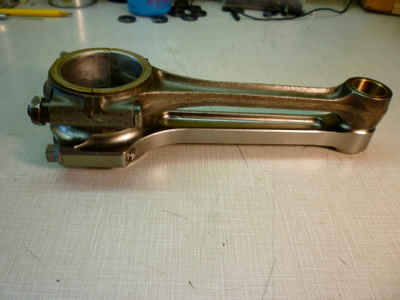 Now the machining of the block is done, and the lower end is going together. More pictures soon. The new rod is a bit heavier than the older one, but without the bronze shell insert of the old one, they actually weigh out about the same. As the weight at the wrist pin (gudgeon?) is a bit more with the new rod, the reciprocating weight is higher, and a bit of crank rebalancing was needed. Nothing major. There has been some progress on the rebuild of the s. 2 motor. 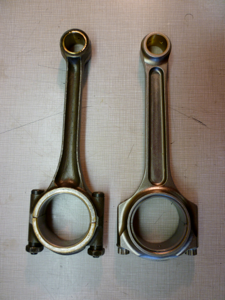 The conrods have been made, and they can now be fitted with shell bearings. The new and old one are shown. the old rod is on top. 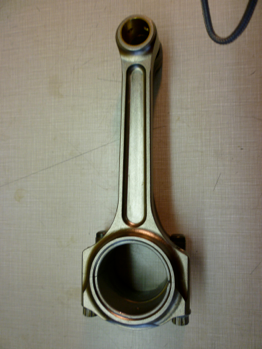 Note the bronze insert in the old rod.